Mahmoud was a grey colt by Blenheim II out of Mah Mahal by Gainsborough, bred by the Aga Khan in 1933. His colour comes from his mother’s side of the family as Mah Mahal was a daughter of the “Flying Filly” Mumtaz Mahal, one of the more notable greys in history. Mahmoud won the 1936 Derby in then record time, and also the Champagne Stakes, the Exeter Stakes and the Richmond Stakes. His Derby victory run in a time of 2.33.8 was a race record which stood fifty-nine years at the demanding Epsom Racecourse. He was retired to start his stud career in 1937 and was sent to Egerton Stud. Possessing a quick turn of foot, Mahmoud had a penchant for being slow from the gate. He preferred firm footing and displayed his speed on such ground. His record Derby victory was achieved on ground that has been described as rock hard due to a shortage of rain in and around the Epsom Downs area before the day of his triumph. Mahmoud’s Derby was quite fortuitous for the Aga Khan since he had unsuccessfully tried to sell Mahmoud as a yearling. Mahmoud stood four years at the Aga Khan’s Ireland farm and then was sold to C. V. Whitney for $85,000. Mahmoud arrived safely in America but just. He was not allowed passage on the original ship he was supposed to travel on as his paper work was deemed as inadequate, so he had to take another ship once the paperwork was sorted. The original ship he was supposed to make his journey on was torpedoed and sank. His replacement ship made it through the dangerous Atlantic safely. There were quite a few sons of Mahmoud who were very good, classy horses on the track. The Axe II for example was one of the top grass distance runners of his generation having won the Canadian International, the Man O’ War Stakes and the San Louis Rey among his many stakes victories. At stud, The Axe II met with success in continuing the line by siring Al Hattab, the broodmare sire of champions Black Tie Affair and Holy Bull. The latter has become an influence as a sire. Holy Bull has sired Macho Uno, Flashy Bull and Giacomo, among his many stakes winning progeny. Holy Bull’s dam, Sharon Brown is inbred to Mahmoud 3 x 4. The Axe II was the broodmare sire of Belmont Stakes winner Caveat, as well as Swing Till Dawn, Green Forest, and leading sire Relaunch by In Reality. The dam of Relaunch is Foggy Note by The Axe II. Foggy Note became a very important broodmare. Her alliance to In Reality would produce not only Relaunch but that one’s full sister Moon Glitter. Moon Glitter’s daughter Ruby Slippers by Nijinsky produced champion sprinter Rubiano and Tap Your Heels, she being the dam of current leading sire Tapit by Pulpit. Cohoes (Brooklyn Handicap, Whitney Stakes) was another successful son of Mahmoud who had a say in future pedigrees. His son Quadrangle won the 1964 Belmont and Travers Stakes. Quadrangle sired Champion fillies Smart Angle, Square Angel and Susan’s Girl. Cohoes also sired Miss Swapsco, dam of the great foundation mare Ballade. Impressive as his sons The Axe II and Cohoes are to further the name of Mahmoud in breeding, his daughters where to out shine his sons in future pedigrees and put his stamp on champions to follow. The bulk of Mahmoud’s legacy emanates through his daughters. Grey Flight was a minor stakes winner but a truly exceptional broodmare. She produced fifteen foals in total from the combination of seven different sires with Bold Ruler being her most frequent suitor as they had six foals together. Nine of her foals became stakes winners. Many of her offspring would go on to great racing and/or breeding careers in their own right. Of her six foals by Bold Ruler, her only son from their trysts was What a Pleasure, winner of the Hopeful Stakes and sire of champion two year olds Foolish Pleasure and Honest Pleasure during a successful stud career. Of Grey Flight’s other foals by Bold Ruler which were fillies, Bold Princess would turn out to be her most notable broodmare daughter as she is the dam of Intrepid Hero (United Nations Handicap, Hollywood Derby). 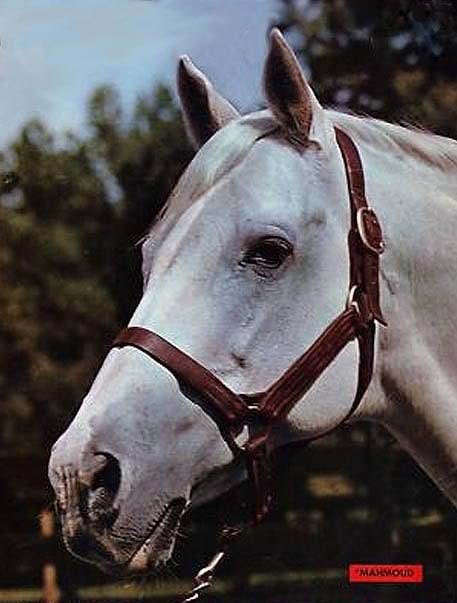 Other foals of Grey Flight to have an impact in racing and/or breeding were Misty Morn by Princequillo, a two time divisional champion and winner of the Monmouth Oaks and Diana Handicap etc, and dam of Bold Lad (USA) and Successor. She would also be a Broodmare of the Year recipient, emulating her mother. Boudoir II by Mahmoud was another successful broodmare. From Mahmoud’s European bred foals, Boudoir II produced Your Host (sire of Kelso) and Your Hostess by Alibhai. Boudoir II also produced Flower Bed by Beau Pere, who in turn is the dam of Flower Bowl. The latter is the dam of champion Bowl of Flowers by Sailor and the influential brothers Graustark and His Majesty, by Ribot. Three more important daughters of Mahmoud that produced important offspring include Koubis, dam of Kentucky Derby winner Determine by Alibhai. Mahmoudess is the dam of multi stakes winner Promised Land by Palestinian. Ghazni produced Cap and Bells by Tom Fool, and she in turn is the dam of 1000 Guineas winner Lady Capulet by Sir Ivor and the good sire Drone by Sir Gaylord. Lady Capulet is the dam of Irish champion two year old and influential sire El Prado as well as Irish champion three year old Entitled. Majideh was as successful on the track as she was in the breeding arena. This daughter of Mahmoud won the Irish 1000 Guineas and the Irish Oaks. As a broodmare she is the dam of Gallant Man by Migoli, perhaps one of the unluckiest of Thoroughbreds in history. Gallant Man had victory in the Kentucky Derby all but completed except for the unfortunate miss judgement of the finish line by his jockey’ the legendary Bill Shoemaker. The Shoe mistook the sixteenth pole for the the finish post and stood in the irons thinking he had already crossed the finish line. The loss of momentum allowed Iron Liege to pass Gallant Man before they crossed the actual finish line. Gallant Man was also unlucky to be born in 1954, a year that has proven to be acclaimed as the best foal crop in American racing. Great horses such as Round Table, Bold Ruler, Barbizon, Nearctic and Iron Liege were contemporaries of Gallant Man. He was never to win any awards for his racing accomplishments, although he would beat each one of the aforementioned at least once during his career. Gallant Man’s Belmont Stakes victory by eight lengths, was a race record until the mind boggling performance by Secretariat sixteen years later. Happy Mood would further the Mahmoud legacy as a great broodmare sire by being the dam of Canadian Oaks winner Cool Mood by Northern Dancer. Cool Mood was inbred to Mahmoud 4 x 2 and in turn produced Shy Spirit (dam of the ill fated champion Izvestia) and Passing Mood (dam of Touch Gold and champion With Approval, both successful sires). Mumtaz, another in what seems an endless line of excellent broodmares by Mahmoud, was the dam of Come Hither Look by Turn-To and Indian Queen by Nashua. Come Hither Look, winner of the Blue Hen Stakes, would produce the good broodmare Pass a Glance by Buckpasser and the unraced Come My Prince by Prince John (dam of Palace Music, sire of Cigar). Indian Queen, while showing nothing on the track, became the dam of multi stakes winner Screen King. Stakes winner Polamia became very important to future pedigrees as the dam of Grey Dawn II by Herbager, major French winner Tryptic by Tyrone, and Right Away by Right Royal V, dam of Royal Way (dam of Garde Royal). Grey Dawn II, winner of the Grand Criterium over the great Sea Bird, would go on to be very successful and influential as a sire at stud. Many of Mahmoud’s progeny inherited his grey colour. However one daughter who did not, she was a chestnut, was Almahmoud. She was the winner of the Colleen Stakes and the Vineland Handicap in a good productive career on the track. In the breeding arena she was destined to become one of the truly great broodmares. Three of her daughters would each produce a sire of importance. Bubbling Beauty by Hasty Road is the dam of Arctic Tern by Sea Bird II. Arctic Tern, winner of the Prix Ganay etc, would become the French leading sire three times. While another daughter of Almahmoud named Cosmah by Cosmic Bomb produced champion Tosmah by Tim Tam, Queen’s Sucree by Ribot (dam of Cannonade), and Halo by Hail to Reason. Halo is an influential sire of great importance and led the North American sire list twice. Among his get were Kentucky Derby winners Sunny’s Halo and Sunday Silence (twelve times leading sire in Japan), the great champion mare Glorious Song and major sires Southern Halo and Saint Ballado. Natalma was the third daughter of Almahmoud who would firmly engrave her name in countless pedigrees of champions. Natalma is the dam of Northern Dancer, arguably the greatest sire in history. Stakes placed Arctic Dancer (dam of Canadian Hall of Fame inductee La Prevoyante) was a full sister to Northern Dancer. Natalma’s daughter Raise the Standard by Hoist The Flag is the dam of Coupe de Folie, who is the mother of Machiavellian. Another daughter of Natalma that had a big say in world-wide pedigree excellence is Spring Adieu by Buckpasser. She is the dam of Razyana, who in her turn produced in incredible sire Danehill. Mahmoud will always be remembered for his extensive and brilliant contributions to blood lines, especially through his wonderful daughters. The list of exceptional stallions and broodmares descending from Mahmoud is no coincidence. His combination of speed, stamina and class became very important to today’s top racing and breeding Thoroughbreds. The exquisite Mahmoud was not a big horse, he stood no taller that 15.3 hands, and was a sociable horse to be around possessing an inquisitive, friendly personality. He enjoyed human company and craved attention. Mahmoud lived to the ripe age of twenty-nine. He is buried at Gainesway Farm in a tract of land that was once part of C.V. Whitney’s Kentucky farm. There also seems to be a high number of top class grey Thoroughbreds these days, which if you look at their pedigrees, you are likely to find Mahmoud somewhere in their genes. Just saying!! Mahmoud was a great one Colin. Excellent write up on a big influence. Yes there are a lot of greys coming from him. Terrific story about a great horse. Thanks for the inside story on Mahmoud. He is so many famous pedigrees and he has passed his color down the line too. I absolutely love Mahmoud. He was a beauty and he is in so many great pedigrees. Hard to think of how the breed would look like if he had boarded the first ship from England instead of the second one. Thank god his papers needed to be fixed. Similar to Princequillo, he barely survived WWII. A big influence for sure.